Review: The Rivals at the Royal Exchange - great pub food, wines & vibes. Re-incarnated Royal Exchange Theatre bar and restaurant, The Rivals, has been hiding in plain sight, just off St Ann’s Square, since September 2017. Another theatre bar, you think, walking through the theatre’s soaring atrium, tables dotting one half of the former cotton trading hall floor. What’s not so obvious, however, is the separate wood-panelled bar and restaurant running along the back of the building, overlooking St Ann’s Square. Named The Rivals after the first play performed at the Royal Exchange Theatre when it opened in 1976, the venue has been overhauled by the team who used to run Chorlton’s The Parlour. Head chef is Anna Fysh of much-missed Chorlton bistro, Gray’s Larder and other team members include Goska Langrish (Hawksmoor, The Parlour), Jamie Langrish and Rupert Hill. Hill is an actor, businessman and former Coronation Street star; projects he and Langrish have collaborated on include Bakers Vaults, The Castle and The Parlour. All this experience means they’ve got the basics right, the look and feel of the place bringing to mind the understated quality of The Parlour. Think wooden tables (there’s a lot of wood), candlelight, drinkable reds (go, just for French red Cru Borgeois Chateau Beaumont – not the cheapest on the list by a long shot at £38 but my wine of the year so far) and great, modern pub food. The Spring menu include pea fritters with vibrant green salsa, freshly foraged wild garlic and potato soup, pop-in-the-mouth feta arancini, a ridiculously tender ‘tower’ (literally a tower) of slow-cooked beef and hunks of freshly cooked apple cake with homemade apple sorbet. As at Gray’s Larder, there’s a gentle intelligence at work in the kitchen. 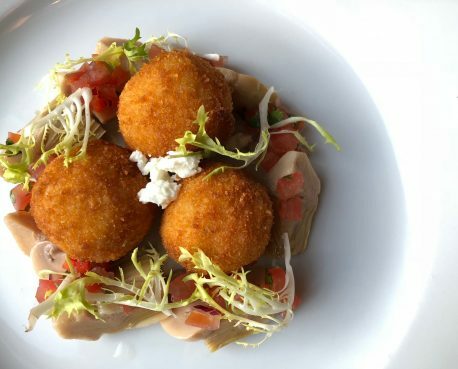 Cod, for example, is offset by an earthy beignet packed with brown crab meat, an actually crisp herb crust (rarer than you’d think) and sweet lemon puree. It’s really outstanding. As is the soup which comes with a homemade scone, enriched with thoughtfully sourced Lincolnshire Poacher cheese. Menus include lunch, dinner and so on, while the pre-theatre menu allows diners to enjoy a starter and main before the Royal Exchange’s evening performance, with wine, table and dessert saved for half time. It’s fair to say that the polished parquet flooring and a well-stocked central bar conspire to create a London-esque ‘private members club’ vibe. This being Manchester, though, everyone’s welcome.